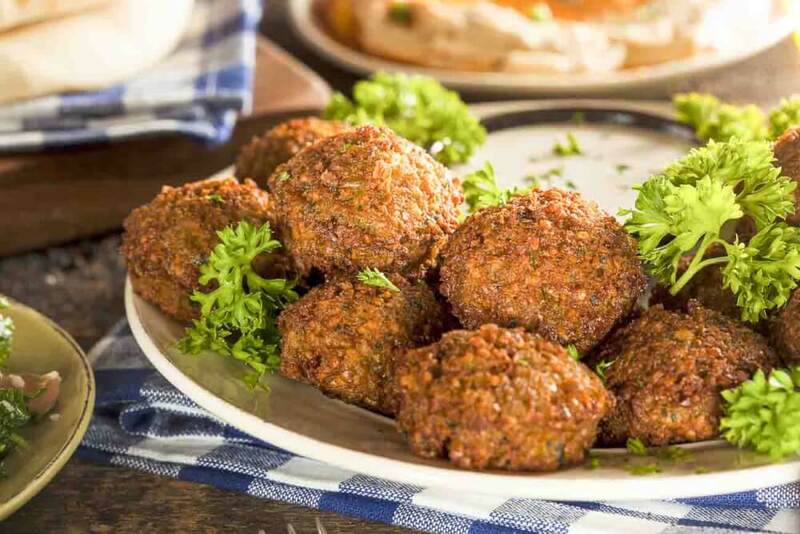 These tasty homemade vegetarian falafels may be nice served Western style in burger buns or, more traditionally, with pita bread. We are making them flat, like burgers, so they can be served with different kinds of bread. If you want to make them round, this is more traditional. Round ones fit nicely in a wrap, while rolling out of burger buns! Try this vegetarian falafels recipe for Saturday lunch or a midweek meal. They go well with red cabbage or rocket (arugula) and some hummus too. They can be ready in under half an hour, so if you're pretty hungry, just rustle these up for a treat. 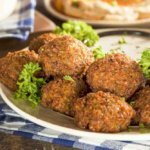 Vegetarian falafels make a delicious alternative to veggie burgers, so if you want to try some exotic flavour and give meat a miss, you aren't going to be disappointed with these vegetarian falafels. 1. Heat 1 tablespoon of the oil in a big skillet. 2. Add the mushrooms and spring onions. 3. Cook for a couple of minutes. 4. Now mix the chickpeas and about 1/3 of their liquid and garlic in a food processor until smooth. 5. Stir in the onion and mushrooms. 6. Stir in the parsley, coriander, cumin and curry powder. 7. Mix in the egg whites and breadcrumbs. 8. Now either let the mixture sit in the fridge for half an hour, or proceed. 9. Heat the rest of the oil. 10. Divide the chickpea mixture into 4 balls and flatten them. 11. Fry them until browned in the skillet. 12. This will take about 5 minutes per side.